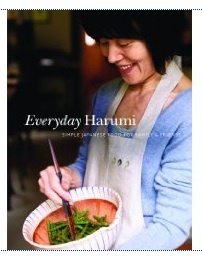 Last weekend I tried a few recipes from the new cookbook Everyday Harumi. The author, Harumi Kurihara, is a homemaker-turned-cooking-star in Japan, where she has a TV show, magazine, tableware line and restaurants. The photographs in her book are beautiful and the recipes are very doable. I tackled the Tofu Steak, a homestyle version of agedashi tofu, a popular appetizer in Japanese restaurants. I rubbed slices of tofu with grated garlic, dipped them in potato starch and pan-fried them. I then topped each piece with scallions, ginger, bonito flakes and a soy-mirin sauce. I've never grated garlic for a recipe before, but it was worth the effort—the flavor is more delicate and I don't think minced garlic would stick as well to the tofu.